War isn’t a tear in the fabric of things… it is the fabric. Michael is an American teacher held hostage in a dark room after being captured in Beirut. Lainie, his wife, holds a vigil for him in an empty room in their house outside DC. As he dictates unsent letters to her from his cell, she vies between Walker, a journalist intent to tell her story to the public and Ellen, a State Department official who wants to keep her quiet. Two Rooms was written by Pulitzer Prize-winning and Tony Award-nominee Lee Blessing. Originally commissioned and produced in 1988, Two Rooms was named Best Play of the Year by Time Magazine. This is the second production by Same Boat Theatre, a Hamilton-based theatre company dedicated to telling authentic and provocative stories onstage that challenge the heart and confront the mind. Previously, Same Boat Theatre produced the acclaimed Finding Mr. Right at the 2015 Hamilton Fringe Festival. 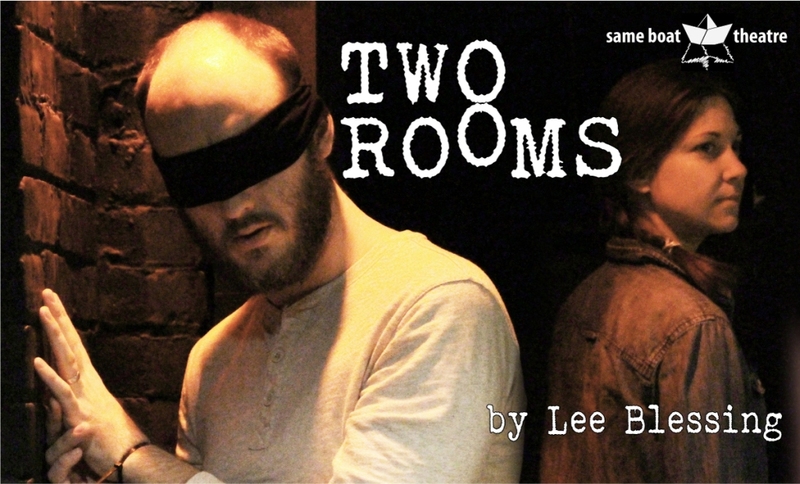 **Two Rooms is presented by special arrangement with Dramatists Play Service, Inc., New York. Jaclyn Scobie is a graduate of McMaster University in Theatre & Visual Arts. She has worked as a director in professional and community theatres across Ontario in Toronto, Port Stanley, Aurora, Kincardine, Barrie, Oakville, and was the Associate Director at Lighthouse Festival Theatre in Port Dover for two seasons. In Hamilton, she directed Dianne & Me by Ron Fromstein for the Hamilton Fringe Festival which won ‘Best of Fringe’ and a run at Theatre Aquarius. Most recently, Jaclyn graduated and received her certificate from Niagara College in Ecosystem Restoration. Aaron Joel Craig is a theatre director and performer. He grew up in Edmonton, Alberta, studied Theatre Performance at Redeemer University and lives in Hamilton with his wife, Cath and daughter, Georgia. Directing credits include Finding Mr. Right with Same Boat Theatre, Conspiracy of Michael and Test for Reaching Symmetry, inbetween.places for Make Art Theatre, Power Play for Redeemer University and The End and the Beginning for ClipClop productions. Performing credits include A Modicum of Freedom, Don Quixote, and Orpheus with Make Art Theatre. Sara Weber is a playwright and performer who graduated from Redeemer University with a B.A. in Theatre and English. In 2003, Sara wrote and performed her one-woman show On the Roof, which toured the London, Toronto, and Vancouver Fringe Festivals. In 2009, she wrote and performed Baggage which toured the London and Hamilton Fringe Festivals. In 2010, she wrote and performed in The End at the Hamilton Fringe and developed the show into The End and the Beginning (Clip Clop Productions). In 2013, Sara’s short play Things Unsaid was produced as part of HamilTEN. Sara has performed in several independent films with Coffeehouse Productions, with Black Box Fire productions (The Metamorphosis, The Trial of Ebenezer Scrooge), and with Reaching Symmetry Theatre (Interface, Test). Lauren Repei is a long time Hamiltonian who graduated from McMaster University with a BA in English and Theatre and Film. Some past theatre credits include Elizabeth in Pride and Prejudice (Black Box Fire), Sarah in Company (Hammer Entertainment), Janet in Waiting for the Parade (The Citadel), Emma in The Conspiracy of Michael (Reaching Symmetry), and Shelly in Finding Mr. Right (Same Boat Theatre) . She directed an adaptation of Franz Kafka’s The Metamorphosis and Tennessee Williams’ The Glass Menagerie with Black Box Fire, and Cakewalk with Dundas Little Theatre. She has served on the steering committee for the Hamilton Arts Awards for two years and is a participant in the Hamilton Fringe’s ALERT program. Danielle is thrilled to be joining Same Boat Theatre in this wonderful production and working with such a fantastic group of people. Danielle is no stranger to the world of tech, having worked backstage quite literally all over the world for Princess Cruises as well as land-based theatre companies in Canada and South Korea. However, there is nothing like the draw of your first theatre, and she is ecstatic to be teching once again at the Staircase. Danielle wishes to give many thanks for her indulging and understanding husband Matt, for going ahead with another of her time-consuming activities, as well as to Lauren for inviting her to be a part of this amazing production.